Tools of the Trade: The Use of Firearms and Traditional Weapons among the Tongs of San Francisco, 1877-1878. Chinese Highbinder weapons collected by H. H. North, U. S. Commission of Immigration, forwarded to Bureau of Immigration, Washington D. C., about 1900. Note the coexistence of hudiedao (butterfly swords), guns and knives all in the same raid. This collection of weapons is identical to what might have been found from the 1860s onward. Introduction: The Evolving Relationship between Firearms and the Martial Arts. In a number of previous posts we have examined the complex, often hidden, relationship between the development of the modern Chinese martial arts and firearms. It is frequently stated that the traditional schools of hand combat represent an ancient body of military knowledge, meant to be applied on the battlefield. With the advent of inexpensive, easily obtained, firearms the martial arts lost their primacy. Now obsolete they were relegated to a secondary world of tradition, physical fitness and the preservation of cultural knowledge. Hence both their normative values and fighting skills are obsolete in the modern world. Of course there is a problem with the preceding line of argument. On historical grounds alone it is entirely wrong. The “traditional” Chinese martial arts, as they now exist, were created almost entirely after the rise of firearms. In actuality firearms have been a dominant battlefield technology since the Ming dynasty, about when the modern synthesis of skills that we now think of as the “martial arts” were first coming together. Likewise these two technologies coexisted for much of the Qing dynasty. Further, they seem to be complimentary goods rather than substitutes. Far from one replacing the other, both seem to gain popularity under similar sets of circumstances. Only in the popular imagination has Kung Fu ever existed in a pristine world without the tyranny of the gun. This is a critical point to grasp. By better understanding the milieu that the martial arts emerged from we can more accurately understand their original goals and what these combat systems are capable of accomplishing in our day. In a previous post I examined a set of pictures of traditional weapons confiscated by the Shanghai Municipal Police in the middle of the 1920s. Within that collection we found a number of swords, sabers, hudiedaos and a huge number of fighting knives. Yet there were also revolvers, sawed-off shotguns and improvised firearms. These imaged bore mute testimony to the fact that both “traditional” and “modern” fighting technologies continued to coexist and be used well into the 20th century. Far from inhabiting two different worlds, firearms and the Chinese martial arts both existed within the same socially constructed sphere of violence. As I mentioned last time, there are some problems with the Shanghai pictures which limit their utility as tools of understanding. We know that the municipal police simply reissued many of the modern semi-automatic handgun they confiscated, and so they were entirely absent for the collection. There were probably other, more subtle, “selection effects” going on as well. The police were choosing to collect and display things that they found interesting. That means that all of the items pictured were probably either rare or remarkable in some way. While the totality of the collection strongly suggested that the weapons of the traditional fighting arts coexisted with modern firearms up through the 1920s and 1930s, it was far from a carefully constructed random sample. We are also fortunate to have a number of primary source documents relating to the social organization of violence within this community. The Tong Wars of the late 1870s and 1880s attracted quite a bit of outside attention, and they are an interesting example of how violence could spread through the dense systems of patronage networks that were so important to southern Chinese society. Unfortunately many of the most valuable records of the early history of the San Francisco Chinatown were destroyed in the 1906 earthquake and subsequent fire which leveled the city. Most of the immigration records from the 1850s-1870s were burned, as were various law enforcement and political documents. Nevertheless, some very interesting things from this early period did survived. A few of these documents even provide rare glimpses into how Tong enforcers armed themselves, and what sorts of violence dominated the “Rivers and Lakes” of southern Chinese martial culture in America during the 1870s and 1880s. While researching another project I had the good fortune to run across an old volume of city records titled: San Francisco Municipal Reports, for the Fiscal Year 1877-1878, Ending June 30th, 1878. Published by Order of the Board of Supervisors. San Francisco: W. M. Hinton & Co., 536 Clay Street. 1878. Luckily Google Books has digitized this series making it widely available to researchers. In “Schedule F” of the “Chief of Police’s Report” is a most interesting list of unclaimed property being held by the city. This includes the contents of the police department’s evidence locker. Each entry in the list included an inventory number, the date the item was acquired, the name of the individual it belonged to or was confiscated from (the report includes both criminal evidence and lost property) and brief description of the item. Unfortunately the list is organized in no obvious manner. It seems to be a simple inventory of a room in which like objects are grouped together in a somewhat haphazard fashion and then cataloged right to left. In fact, one strongly suspected that the “items numbers” included in the report were a fiction created for publication as they do not seem to have any relationship to the nature of the object or the date it was acquired. However, coming to the end of list I discovered that there were quite a few confiscated weapons being held as evidence, many of which had come from the residents of Chinatown. These were mixed in with other assorted weapons and items that were collected in other neighborhoods around the city making it hard to get a clear picture of what was going on. After reviewing “Schedule F” a few times I determined that all of the weapons were in the later half, so I entered this information into a simple Excel spreadsheet which you can access here: Weapons of San Francisco 1877-1878. Certain other items of interest, including a “coat of armor” confiscated from Ah Chung on January 12, 1878, did not make it into my data-set as they fell outside the range of inventory numbers that I entered. However, all of the “offensive weapons” in the police evidence locker were included. The volume of the series that I came across (1877-1878) included 75 different confiscated weapons, almost all of which were either handguns, knives or more specialized daggers or swords. This is not quite enough observations to support complex econometrics, but it is more than enough to draw some pretty reliable descriptive inferences. Chinese Highbinders and their Weapons in San Francisco. Harper’s Weekly, Feb. 13th, 1886. In the future it may be possible to build a much larger, more reliable database by combining the data from multiple volumes of this series. That would allow for actual statistical analysis of the findings, and it might reveal some very interesting trends. One of the reasons why the years 1877-1878 are interesting is that they sit right at the start of the famous San Francisco “Tong War,” when multiple Chinese groups came into conflict with one another over the control of the neighborhood’s various illegal enterprises (including narcotics trafficking, gambling and prostitution). It would be very interesting to see whether the mix of weapons carried (and eventually confiscated by the police) changed as the violence ramped up in the coming decade. The 1870s are a fascinating period to explore for other reasons as well. Many of the great names of the Southern Chinese martial arts, such as Huang Fei Hong (Hung Gar), Chan Heung (Choy Li Fut) and Leung Jan (Wing Chun), were all actively shaping their systems during this period. If you ever wondered what sort of weapons an early practitioner of Wing Chun or Foshan Hung Gar might have realistically expected to encounter on the street, read on. Exploring the Data: The Weapons of the Chinese Tongs, 1877-1878. A few brief words about the basic demographic situation in San Francisco in the late 19th century are necessary before we go on. The city as a whole grew rapidly throughout the latter half of the 19th century, becoming the 9th largest metropolitan area in the US by about 1900. However, from the middle of the century to about 1890 the Chinese population grew even more quickly, thus establishing themselves as the most important minority community in the region. In 1880 the total population of the San Francisco area is estimated to have been well over 200,000 individuals. 90% of this population was comprised of Caucasians. About 21,000 Chinese immigrants lived in the city, and they constituted about 9% of San Francisco’s total population. A very small number of African Americans, Latinos and Native Americans made up the remaining 1% of the population. 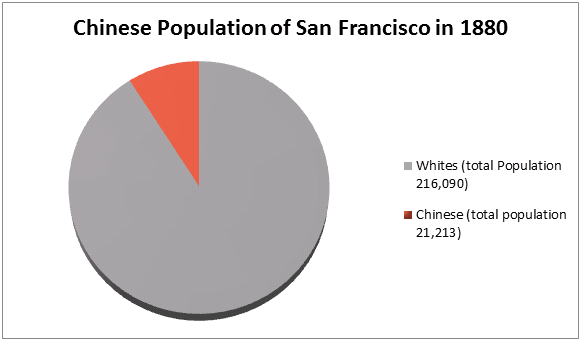 Figure 1: Chinese Population of San Francisco, 1880. While the Chinese population of the city in the late 1870s may have been less than 9% of its population, they seem to have been inordinately overrepresented in the police department’s evidence locked. 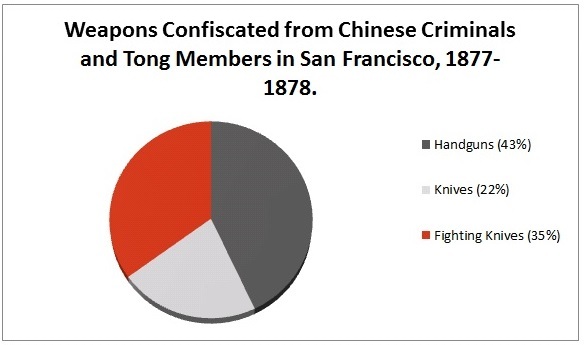 Nearly half (47%) of all of the weapons confiscated from suspects and held as evidence in 1877-1878 came from Tong members or other Chinese criminals. This figure no doubt reflects the dominant role that the Tongs had already come to play in human trafficking, illegal gambling and narcotics. The large number of firearms and fighting knives being confiscated from within this community was also probably an artifact of the early stages of the “Tong War,” which was set to escalate dramatically in the early 1880s. Certainly crime was a pervasive problem in Chinatown, and most of the victims of this violence were other Chinese immigrants. 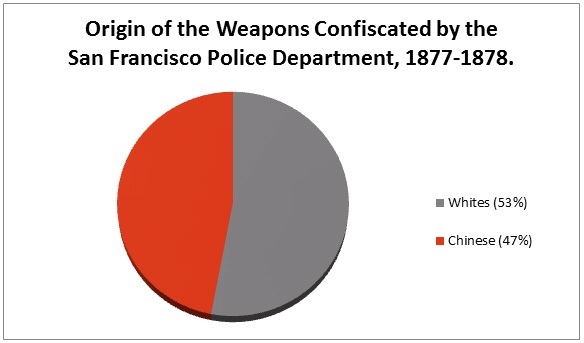 Figure 2: Origins of Weapons Confiscated by the San Francisco Municipal Police Department. When thinking about the “Old West” it is easy to get caught up in the mythos of the gun. Rarely do we stop to remember that a new Colt revolver might cost the equivalent of many months wages for the average worker. These items were expensive enough that not everyone could freely buy them. Yet these economic constraints notwithstanding, it is truly remarkable how commonly they were found in the hands of criminals in San Francisco compared too much cheaper weapons like Bowie knives or daggers. Just under half of all of the weapons in the police evidence locker (43%) were firearms. Of these 100% were handguns. Interestingly not a single rifle or shotgun was being held as evidence when the “Schedule F” inventory was made in 1878. There was some variety among the handguns listed. The inventory contained a handful of single-shot, cartridge loading, guns. There was also a lone black powder revolver and one derringer. Everything else was a modern revolver. The most popular gun appears to have been the Colt, followed by Smith and Wesson, various European makes and lastly Remington. About a third of the weapons confiscated were “knives.” This category was never fully explained in the source material, but it seems to indicate a weapon with a single edged and fixed blade. 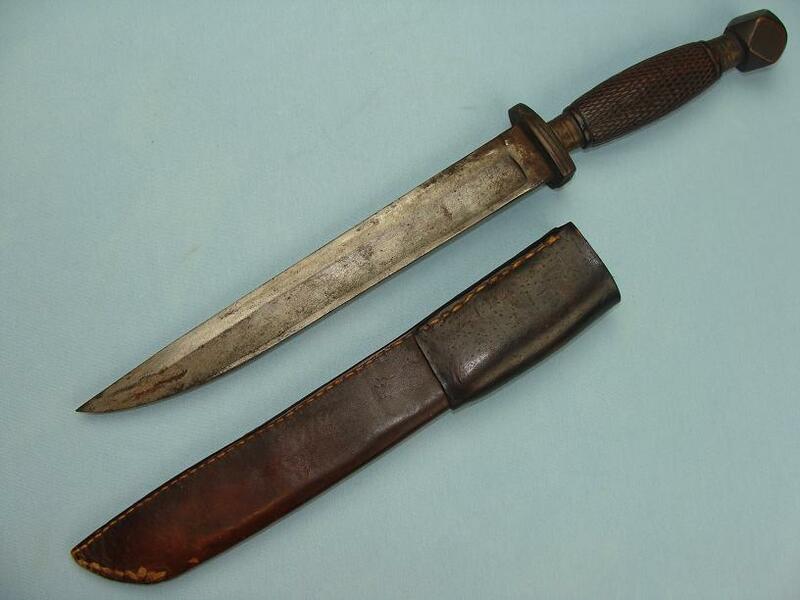 Of course the Bowie knife was still quite popular in the American West and South after the Civil War. These would have been a common personal weapons or even a fashion statement. Such knives also served other utilitarian functions and so one could probably make the argument they were “multipurpose blades.” The police occasionally confiscated “pocket knives” as well, but classified them different from the main body of “knives.” Fixed bladed, single edged, knives appear to have made up about 30% of the confiscated weapons in police possession. The last category, “Fighting Knives” is a composite category created by myself to indicate a range of more “tactical” weapons that the police occasionally came across and took note of. These include specialized blades and fighting knives that fell outside of the norm established by the multipurpose Bowie knife. Examples of “Fighting Knives” include long or short double edged daggers, hudiedao or Butterfly Swords (occasionally carried by Chinese Tong enforcers), and anyone carrying or fighting with a pair of blades. As one might expect these more specialized weapons were less common, but as a category they still made up 27% of all weapons held by the police in 1878. Figure 3: Nature of the Weapons Held by the San Fransisco Police Department. 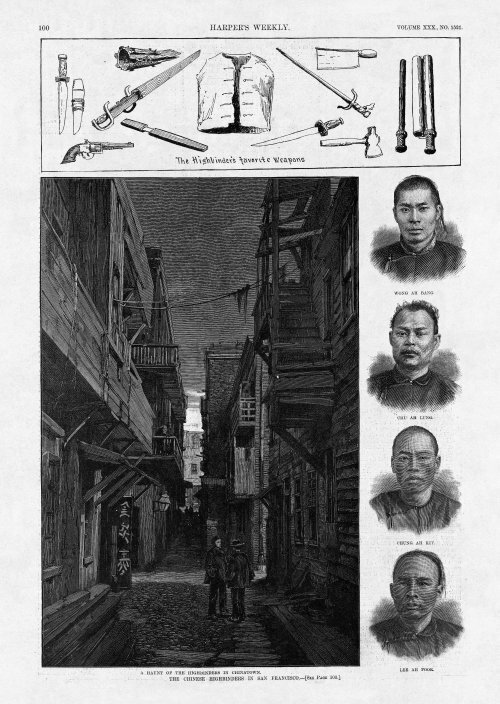 Now that we know a little more about what sort of weapons that were circulating on the mean streets of San Francisco in the 1870s, we can ask some more meaningful questions about what was going on in Chinatown and among the various Tong enforcers and gangsters. While not a perfect model, these percentages are highly suggestive of the ways that their Triad cousins back in Guangzhou may have been armed as well. The first thing that we notice from these numbers is that even in the middle of the 1870s, relatively expensive firearms are far from rare. Nearly 43% of all weapons confiscated from Chinese suspects were handguns. With a couple of exceptions these tended to be modern, high quality weapons. It is also interesting to note that while residents of Chinatown appear to be many times more likely to be involved in a violent crime (either as a perpetrator or victim) than the average citizen, Chinese criminals are no more or less likely to be armed with a firearm. Roughly the same number of handguns were confiscated from both White and Chinese suspects. 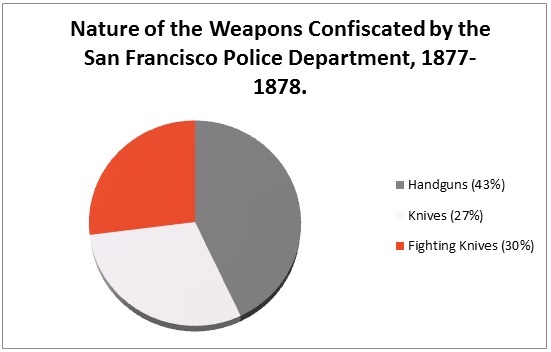 Figure 4: Breakdown of Weapons Confiscated from the San Francisco Tongs, 1877-1878. Only 22% of all weapons taken from Chinese suspects were regular, single edged, knives. Of course the Chinese made their own styles of knives, some of which featured large coffin shaped blades. 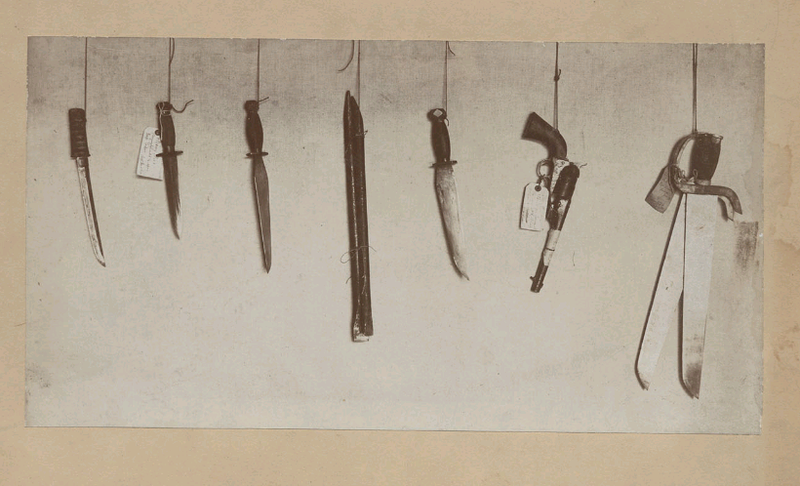 Various pictures of these weapons appear in police records and period publications on Tong violence. 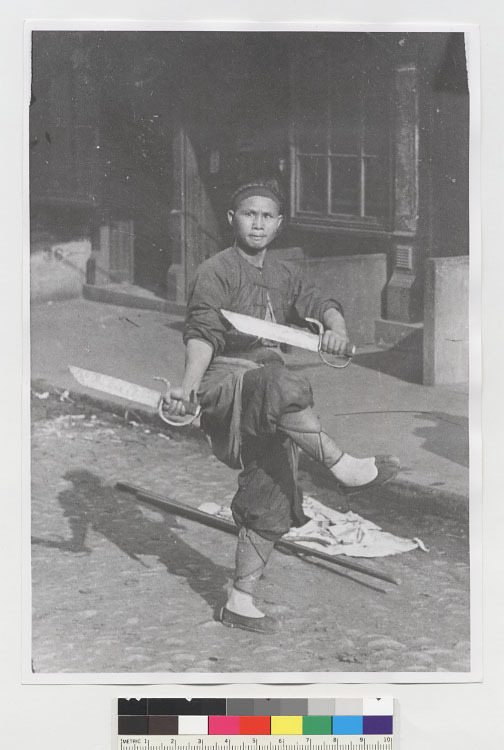 Martial artist on the streets of San Fransisco, circa 1900. Arnold Genthe and Will Irwin. Genthe’s Photographs of San Francisco’s Old Chinatown. New York: Mitchell Kennerley. 1913. (First published in 1908). A high resolution scan of the original photograph can be found at the Bancroft Library, UC Berkley). A few obvious conclusions stand out when looking over these statistics. A number of historians have noted that firearms were common in southern China during the last half of the 19th century, when the modern Chinese martial were really beginning to assume a recognizable form. We know that bandits in the hills found an ample supply of rifles, and that caravan guards and armed escorts carried Colt revolvers along with their pudao (horse knives) and swords. Yet it is still striking just how common modern handguns had become in the hands of the urban criminal element. I suspect that the statistics for San Francisco are roughly similar to what one might have seen in large cities (Shanghai, Beijing or Guangzhou) in China as well. Unfortunately I have not been able to locate any police records from the late Qing that provide comparable data. In fact, modern police and public safety institutions would not be created in most Chinese cities until the 1920s, so it is unlikely that this type of “data” was ever collected in the first place. It is also clear that the types of patronage networks and economic competition seen in southern Chinese society could generate large amounts of violent conflict. Perhaps this should not surprise us. Historians like Frederic Wakeman Jr. have documented the complex intersections between southern Chinese social structure, economic competition and the periodic eruption of low-level violence in some detail. 19th century San Francisco as a whole was a fairly dangerous place by modern standard, yet it is clear that even in this environment the constant competition and violence between the Tongs stood out as something noteworthy. As known figures on the margins of the “Rivers and Lakes” of the economic underworld, this is exactly the sort of environment that individuals like Huang Fei Hung or Leung Jan would have found themselves in. Further, it is clear that at least some Southern arts (such as Wing Chun) are a direct response to this level of social disruption and potential violence. In other cases gangsters and Triad members simply opened their own martial arts schools to train enforcers and to act as a cover for their more nefarious activities. Firearms were clearly part of this world. But so were knives, daggers, short swords and blunt objects. If one is not preparing their student to deal with this full range of weapons and violence, they are not really teaching a “traditional” southern Chinese martial art. As suggestive as these records are, it would still be better to have good first-hand accounts of the use of both firearms and the martial arts in 19th century southern China. In the next post in this informal series we will review detailed accounts of the actual fighting strategies and techniques employed by the early Taiping Army, as well as other rebel groups in central and southern China. These accounts were recorded in 1850s, another critical decade in the evolution of the modern Chinese martial arts.